Unwind after a long day with a nice long soak in the tub. Before visiting Japan over the summer (where I learned quite a few beauty lessons), I hadn't realized just how integral bathing was to Japanese culture. While traveling across the country, I was amazed at how deep the bathtubs were everywhere I stayed. As a lifelong New Yorker, I've grown accustomed to only having access to tiny shallow bathtubs, or sometimes just a shower, so this felt like a real luxury to me. I took advantage of that by taking a nightly bath, which was a great way to decompress after long days full of sightseeing in extremely humid, 90-degree weather. "In Japanese culture, taking a bath is an important and much-loved daily ritual, seen as a way to unwind and relax at the end of a long, stressful day," explains Tokyo-based blogger Alisa Kerr, founder of Tokyo Beauty Book. Kerr notes that there is an important separation between showering and bathing. Showering is all about cleaning your body, washing your hair, and completing any other grooming tasks (like shaving). "When you are completely clean, you then move to the bath and take a long soak in a hot, deep bath," says Kerr. "Soaking in a warm bath is believed to have many health benefits, including relieving muscle pain, improving circulation, raising the metabolism, and giving the skin a dewy glow." Four years ago, Françoise Decatrel started a line of Japanese-inspired bath and body care products, Amayori, after traveling to Japan and visiting a traditional onsen (a hot spring bath) in Kyoto. "It was so simple, beautiful, and calm," she remembers. "I didn't want to leave that behind." So when she got back home to the United States, she started taking baths every week. "I found that the only time I was really away from my phone was when I was in the bath," she says. That became the catalyst for her to leave her high-stress job in real estate and focus on launching her own line of products centered around an activity many of us don't think we have time for: bathing. 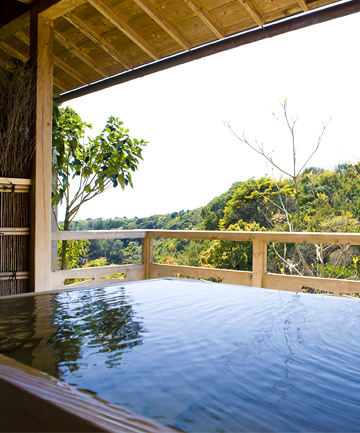 Luckily, you can reap the benefits of Japanese bathing without booking a trip across the world. "There are no real rules or equipment needed to take a Japanese bath — it's very individual," says Kerr. "The most important thing is to take as much time as possible — this is not to be rushed. A Japan-style bath is daily self-care ritual that almost everyone can enjoy at home." That being said, there are certain steps you can take to make your bathroom feel more like an oasis away from the busy world. Keep reading for some of our top tips on how to recreate the experience of a Japanese bath, in the comfort of your own home.